The general purpose transition joint probe style is now available with any of our 44000 series thermistors as sensing elements. 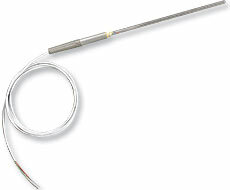 The probe transitions to 36" of PFA-insulated two-conductor lead wire and terminates in stripped leads. For Special Options Consult Sales or Temperature Engineering for Availability and Pricing. Nota: To order with a different Series 44000 element, replace the “44004” with the desired element. No add’l cost for different 0.2°C interchangeability elements. Add $11 for 0.1°C interchangeability elements. For phone plug termination, add “-PP” to end of model number and add $7 to price. Add $1/in for probe lengths over 12". Probes under 12", no add’l charge. Add $1.40/ft. for leads over 36", and modify model number.